Washed. Ransomed. Awakened. Purchased. Rescued. God must have known we'd need help understanding his work for our salvation, because he inspired the biblical writers to use a range of "word pictures" to describe that work. Each of them is a bright facet in the jewel of our salvation, but there's one word that stands out as dearest. How precious to know we were wanted. We were sought. We belong. It's an image of grace, costliness, and privilege all at once. To speak of adoption reminds us, second, of the price paid to make us God's children. Anyone who has adopted a child can tell you the huge costs, both financial and emotional. In Galatians 4, Paul tells us what it cost God: We are told God's Son was sent to redeem us. The death of Christ was like a price paid to set a captive free. Third, "adoption" is a word picture that reminds us of privilege. We were paupers taken off the street to become sons and daughters of the King. We now have the honor to come into his presence with our prayers here and to inherit eternal joy hereafter. I got a little glimpse of the wonder of this adoption when I first saw The Blind Side. The 2009 film recounts the true story of NFL star, Michael Oher. As a teenager, Oher was down and out until Leigh Anne Tuohy cared enough to take him in and become his legal guardian. 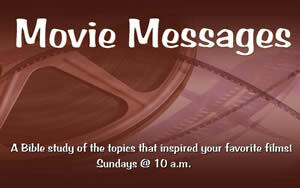 It's the second film in our new sermon series, Movie Messages. We're looking at what the Bible says about the themes of some popular films. Catch up with the series at HillcrestAustin.org/Sermons, and join us for the next installment at 10 a.m. this Sunday. Bring a friend!